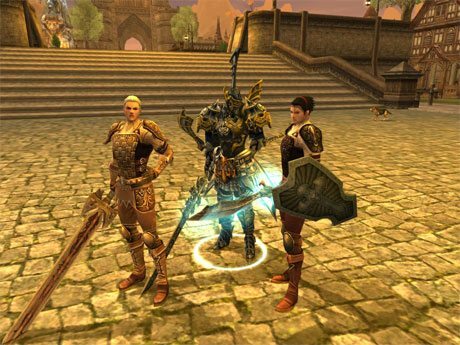 Layonara, created by Leanthar as a PnP world in 1986, was brought to life using the Aurora Toolset from Neverwinter Nights as a role-play-action server and is hosted at MAE-WEST in San Francisco. The online world has been running and expanding since June 24th 2002 and all servers are running at least Intel 2.4GHZ with at least 512 Megs, some have as much as two gig, of ram and are connected via a 100meg LAN and connecting to the Internet via fully burstable dual T1’s. And what makes Layonara different from the rest then? Well, to start off, Layonara is a huge world of 1400+ game areas spread across four game world servers and one quest server, although there are seven servers in total that are used to operate Layonara. Each game world server represents one or two continents and islands and there are several ways to travel between them One server is dedicated to the planes. When you set out into the world there are persistent storage chests and a world-wide banking system that provides safe storage of your items and gold as you travel the lands. There are also bind stones which can be found in temples and larger cities that an adventurer can bind his/her soul to which he/she will be returned should your character die. Well, I’ve seen that on other worlds as well. Ah, but there is more. We have a very active team of 30+ GM’s and Content Team Members. o Over the past year and more we have had about 40 scheduled quests run per month, not to mention the quests that are run by our GMs ‘on the fly’. You can also request character development quests for your character where one of the Quest GMs will then develop an adventure for your character to take him/her in a direction you want to go. o Over 1,700 custom-made creatures and clans that were made to inspire players to team up. o 1000’s of customized items. o Layonara specific Prestige Classes as well as allowing the majority of the original ones. o 20 subraces, using dynamic item properties. Including Dark Elves, Tieflings, Half-Giants, Orcs, Goblins, Forest Gnomes, Brownies, Sea Elves, Wemic’s and several more–not to mention more may be added in the future! o Layonara Custom Feats such as Eschew Materials which allow spell casters to ignore the need to carry spell components, Daylight adaptation for underdark subraces and more! o An immense Craftable Natural Resources (CNR) system consisting of Armor Crafting, Alchemy, Enchanting, Fishing, Food Crafting, Gem Crafting, Infusing, Musical Instrument Crafting, Poison Making, Scribing, Smelting, Tailoring, Tinkering, Weapon Crafting and Wood Crafting. Several of these were made by one of our Content Team members and were implemented first on Layonara! This CNR list is ever evolving to adapt to players needs and requests. o A fairly in depth spell component system that allows either the purchase or harvesting and crafting of components to cast spells. o A budding new Deity relationship system, e.g. if you cast a divine spell, it won’t work on characters that follow deities that are hostile to yours. o 400+ custom created icons for gem dusts, leathers, poison vials and other CNR items! o A fully customized death system. Rather than XP loss at death there are temporary stat penalties to increase the realism of the pain and stress dying causes the body. o Fully ride-able horses after a character reaches a certain level. o A unique farming system that allows tending to crops, orchards and livestock. o Many customized spells that fit with Layonara and its systems. o Player owned houses that can be decorated to your liking. Interesting, so what else is there? In addition to all the scheduled quests there is also the main plot run by Layonara’s creator Leanthar. Sinthar Bloodstone who was banished from Layonara over two-thousand years ago has returned. When he was banished he swore vengeance on the dragons and on all mankind. He now has destroyed nearly all of the Dragons that were still alive. His forces control all but two continents and two islands and he grows stronger by the day. It is time for Layonara to unite your character is one of the heroes to answer the call. So I can change the course of history? YES! Each character, regardless of his/her level, has a role that fits into the story of the world and even the smallest action can change history and shape things from peasants to gods and houses to continents. The players help to change the world on many levels. Can I also take my character to Epic levels? Yes you can. We know that on Persistent Worlds many players play hundreds of hours a month, so we do allow advancement up to 40th level but getting there is not an easy task, it takes a long time and a series of Character Development Quests. We currently have a few Epic level characters as well as several players nearing the threshold. Lower level advancement is fairly quick up to 12th Level. Usually, a very active player can reach level 7 in under a week. Sounds good. So how do I start playing on Layonara? Go to our registration page and register for a forum account, for free of course, you’ll then get an email with how to start out. As mentioned above, Layonara is a role-play-action server (but as you have read above there is plenty of action with all those areas and custom monsters) because of this you have to submit a character for approval together with a short biography so you have a basis to start your character from. Don’t worry, it doesn’t have to be an extremely long bio and it is usually approved within a matter of hours. There’s also a Layonara Handbook that will give you plenty of ideas to create your character or find out more about the world. The handbook shows all of the changes in the world, many at the hands of the players. Since the custom monsters were made to inspire players to team up Layonara is not an easy world if you prefer to travel solo, however; our dedicated and loyal player base that is often on at all hours so in general it’s not too hard to find some travel companions. Layonara is also a lower magic world than most persistent worlds that means that we have a lower drop rate of magical items and powerful goods. That is not to say that we do not have them, many do exist and most can be created through the CNR system. Most of the items do have level requirements, which might look a bit strict, but this ensures that even high level players get excited when they get a new piece of equipment. Submit your own encounters, adventures, entire campaigns, or short stories! Our visitors would love to read your original ideas! Visit our Contact Form and anything we publish, we’ll give you full credit! If you play World of Warcraft, check out the site Tales of a Priest which gives tips and tricks for playing a priest character! The quest for the Holy Grail is the greatest adventure of all time! Visit Sangraal.com (which means Holy Grail) for philosophy and history about the Holy Grail and more.